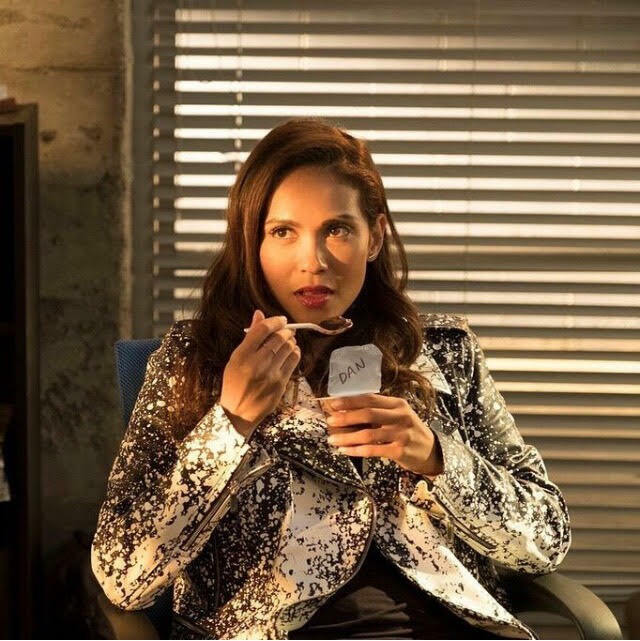 Maze (Lesley-Ann Brandt) eats Dan’s pudding. Image courtesy of ‘Lucifer’/Netflix. Season 3, Episode 3: “Mr. and Mrs. Mazikeen Smith”– Episode three of the season brought us something we had been waiting for: a Maze-centric episode. Maze, with some encouragement from Lucifer, decides to bounty hunt the most difficult person she can. She easily tracks the man to Canada, and upon getting him handcuffs, she asks him to fight. But he does not fight back in the knock-down-and-drag-out way she was hoping for; instead, he slips the handcuffs off himself and onto her. 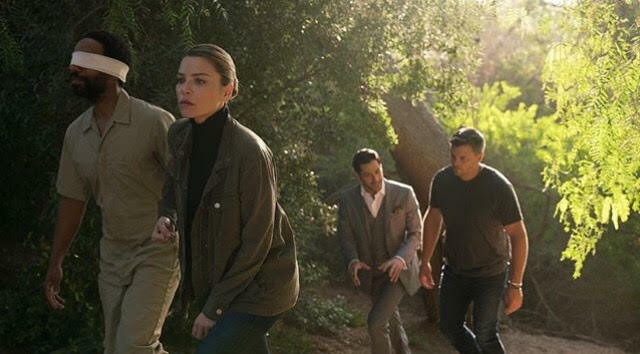 Sinnerman (Kevin Carroll), Chloe (Lauren German), Lucifer (Tom Ellis), and Pierce (Tom Welling) walk through the woods. Image courtesy of ‘Lucifer’/Netflix. Season 3, Episode 9: “The Sinnerman”– We finally get to see the man Lucifer believes kidnapped him, returned his wings, and stole his Devil face. After several people Lucifer had given favors to turn up dead, the team focuses on the Sinnerman. And luckily for Lucifer, that is exactly who he gets a call from. Lucifer ends up in an abandoned building, getting locked inside what appears to be a freezer of some sort, and the Sinnerman appears on a small TV screen in front of him. After some back-and-forth between the two, the screen goes black. It seems Lucifer is trapped in the room, confined by the thick, reinforced steel walls, until Maze appears on the other side of the door with a bone to pick, forcing him to listen to her before opening the door. Once Lucifer calls Chloe, who is with Pierce, and describes the man he saw on the screen, they realize he has described the man that just walked into the restaurant they are watching. Chloe follows the Sinnerman into the restaurant, and Pierce waits behind the building, grabbing him when he comes out. Back at the station, Lucifer walks into the interrogation room to find the Sinnerman has gouged out his own eyes with a pen, so that he does not have to look Lucifer in the eyes. Lucifer and Pierce have dinner while working a case undercover. Image courtesy of ‘Lucifer’/Netflix. 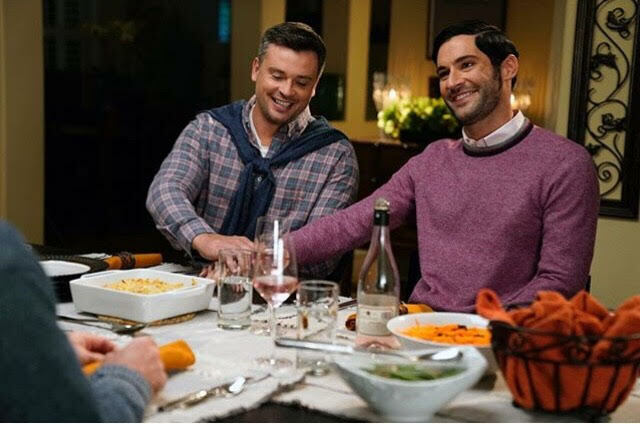 Season 3, Episode 13: “‘Til Death Do Us Part”– This episode is bound to make you laugh from the second Lucifer appears in his penthouse sporting a mask with a chainsaw in hand. To solve a murder, Lucifer and Pierce go undercover as a couple in your stereotypical American suburban neighborhood. While talking with their new neighbors, “Luke” (Lucifer) and “Mark” (Pierce) learn that someone has been leaving threatening notes for people in the neighborhood for various reasons, such as having the ever so sinful untrimmed hedge. And who better to lure out this possible murderer than neighbors from Hell? “Luke” proceeds to try to instigate an encounter by throwing a party in his front yard (complete with a DJ) while wearing an American flag banana hammock, having water wars with bikini clad women, and doing some welding work in the early morning hours. When a new lead surfaces, “Luke” and “Mark” throw a party and end up giving their new pals exactly what they live for: drama. The “couple” does what couples do and have a spat over how things are arranged on the table; “Luke” storms off but eventually comes back and all is well in suburbia, especially after the killer is outed. 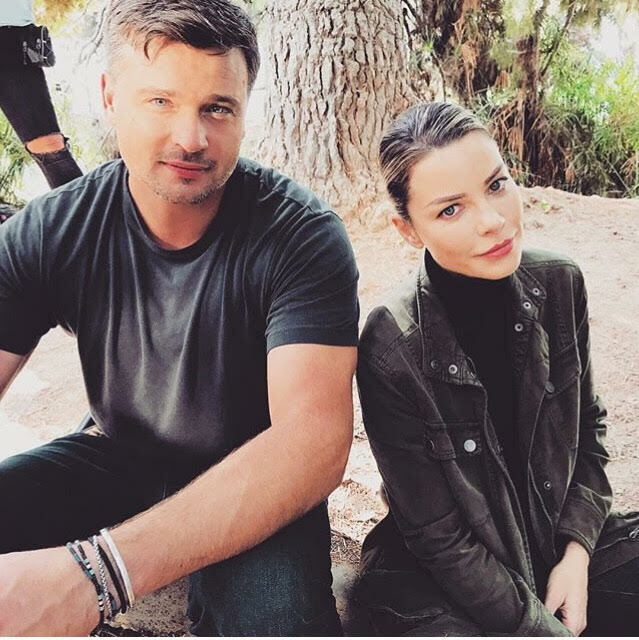 A behind-the-scenes shot of Tom Welling and Lauren German taken by Tom Ellis. Image courtesy of ‘Lucifer’/Netflix. Season 3, Episode 22: “All Hands on Decker”– Chloe’s impending wedding gave this episode a serious undertone, but in a fashion that we have all come to expect from this show, it is dealt with in a fun-filled manner. Ella is in charge of the bachelorette party… or was, until Maze takes over and turns what was sure to be a booze- and stripper-filled night into what some might call Hell, as a way to ensure no doubts arise in Chloe’s mind about marrying Pierce. Thanks mostly to Charlotte, who wants the complete opposite of Maze, the ladies (Charlotte, Chloe, Maze, Ella, and Dr. Linda) end up on a party bus cruising the streets of L.A. with the Malibu State water polo team (that Charlotte was supposed to be prosecuting) as the night’s stand-in strippers. The episode also gives us Lucifer channeling his inner Chloe at an attempt to understand why she was marrying the “overstuffed man ham,” Pierce. 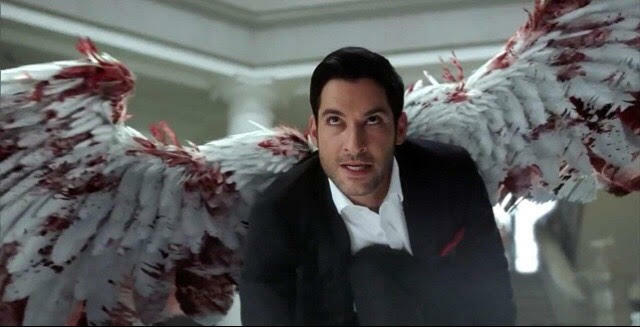 In the midst of a fight, Lucifer unfurls his bloody wings. Image courtesy of ‘Lucifer’/Netflix. Season 3, Episode 24: “A Devil of My Word”– Two episodes before the season 3 finale, Chloe and Lucifer walk into Pierce’s trap, and bullets fly. I love this episode (and this season as a whole), because we get to see Lucifer unfurl his wings and protect Chloe from the hail of gunfire raining down. By doing that, however, Lucifer becomes vulnerable, and his white wings slowly turn red. After flying himself and Chloe to safety, Lucifer bursts back into the room through a window and, in a spectacular shot, we get to see his wings again. This entire episode really allowed us to see Lucifer as a protector rather than, well, the Devil. Disney Highlights Dolphins for Next Disneynature Film!